A few days ago Rob posted an article on how to get the Windows Experience Index score back. 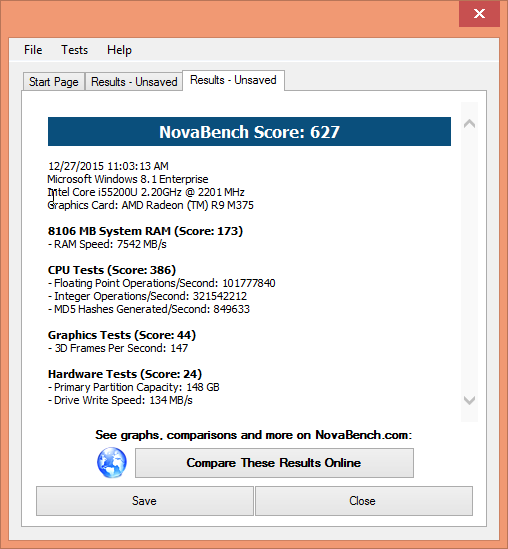 Today we are going to showcase our PC Performance Scores using another freeware utility, Novabench. It is a benchmarking utility for Windows and Mac. Novabench is a versatile and advanced aggregator than WEI that tests the performance of various components of your computer and then assigns scores to each one of them. A higher score indicates a better performance. Novabench not only rates your computer but also can be used to find the various performance bottlenecks on your system. The scores generated comes from CPU Tests that include Floating Point Operations, Integer Operations and MD5 Hashing, GPU Tests calculating 3D Frames per second, Hardware Tests measuring RAM Transfer Speeds and Drive Write Speeds. Novabench is extremely easy to use even for inexperienced computer users. Make sure you close all the applications while running the tests to get a higher score. Click on Compare These Results Online from the results window after finishing the tests and post the link here along with your score in the comments section. Scores and Stats here shows the Highest rated PC's posted at NovaBench. I will make sure to update the Top 10 Scores of our readers in this article. The harddrive is fast (SSD), 268 Gb - sorry 480 Gb (it was only one of the partitions that was 268 Gb - I have Linux on another). Well I scored a 1434 but it wouldn't let me post compare my results! :( Home built from ground up several years ago. Intel I7 and still going fairly strong! PC Pitstop runs excellent tests and does comparisons all online and requires no installation. Runs best in Internet Explorer. boot drive PCIE M2 NVM +3 SSD + 7 spinner HD. Will try later with minimal or maybe safe mode if it runs under that and compare. The board & CPU are brand new (replaced Z170/I5-6600 Skylake that died last week). The rest were from older builds swapped in previously to the Z170 build . There are a few bugs to swat yet; this build is only 3 days old. Link to the score output? Self-built/upgraded general purpose IvyBridge/DDR3 mini ITX, hardware at stock speeds, GPU blower type. This is a system I built to allow for video editing. Shut down some running processes & exe's. I scored 1589 on a custom built desktop. I use an SSD for my OS and programs and a 3 terabyte drive for data, then it backs up to a 16TB Synology server to keep entertainment that is shared via a wired network that I installed when I built my house 16 years ago. Home built desktop May 2014. My objective was to build a PC with the capabilities I needed at an affordable price that would give me years of service. I selected the Intel i5-4670K CPU with 16GB of RAM (with 2 open slots) and a 256GB SSD paired with a 4TB HDD. Onboard Intel GPU meets my needs now and I can upgrade later if I want to.